In our everyday life, we tell the hotness and coldness of different substances and weather in terms of temperature. We also use temperature to find the severity of the fever. For example, our normal body temperature is 98 ⁰F. This temperature increases when we caught in the fever. We also set our oven and electric stoves at a certain temperature to cook food. We use temperature to describe the hotness. But in physics, temperature is defined as the average kinetic energy of molecules in a substance. If the temperature of a substance is more, then its molecules will have higher kinetic energy. Temperature is measured with a device called thermometer. Thermometer works on the principle that, when the temperature of a substance rises they expands. Some materials, like mercury and alcohol expands more. So, they are used in the thermometers. However, electronic and infrared thermometers are also developed. They use special sensors to measures the temperature instead of mercury or alcohol. There are various units to measure the temperature of a substance. These units are Celsius, Fahrenheit, kelvin, and Rankine. Celsius: Celsius is widely used unit in the world. It measures the temperature in degrees, abbreviated as ⁰C. This temperature scale measures the freezing point of water at 0 ⁰C and boiling point at ⁰C. Fahrenheit: Fahrenheit is famous in US and it is also used by doctors. This temperature scale measures the freezing point of water at 32 ⁰F and boiling point at 212 ⁰F. Kelvin: This scale is also considered as absolute scale and is mostly used by scientists. This scale is not measured in degrees and is abbreviated as, K. The zero point is set at the absolute zero; the temperature at which average kinetic energy of a substance is zero. The freezing point of water is measured at 273 K, and boiling point at 373 K.
The scale Kelvin was founded by Lord Kelvin. He Proposed the unit on the basis of absolute temperature of a substance. 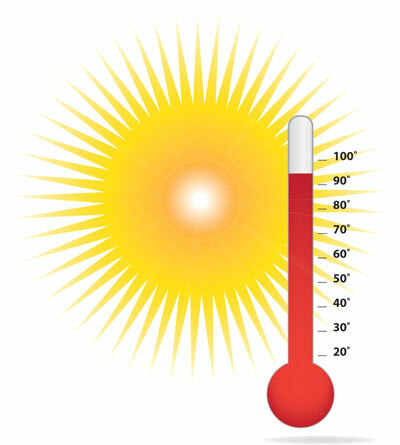 The first thermometer was invented in 1600s and was called thermoscope. Electronic thermometers use the electrical property of substances to measure the temperature. Abdul Wahab, "Temperature," in Science4Fun, April 13, 2019, http://science4fun.info/temperature/.